China responded on Wednesday to the Trump administration’s published list of Chinese exports that could soon be subject to a steep 25 percent tariff. The White House list covers some $50 billion worth of Chinese goods in sectors such as aerospace, robotics, IT and machinery. China’s Ministry of Commerce said Wednesday that it would impose tariffs of 25 percent on 106 types of U.S. products worth $50 billion, including soybeans, aircraft and automobiles. There was no indication of when the new tariffs would take effect. The Commerce Ministry also said it had opened a dispute against the U.S. at the World Trade Organization. China’s commerce ministry said it has initiated a World Trade Organization dispute procedure against the U.S. 301 tariffs investigation on Wednesday, amid an escalating trade dispute between the world’s two largest economies. 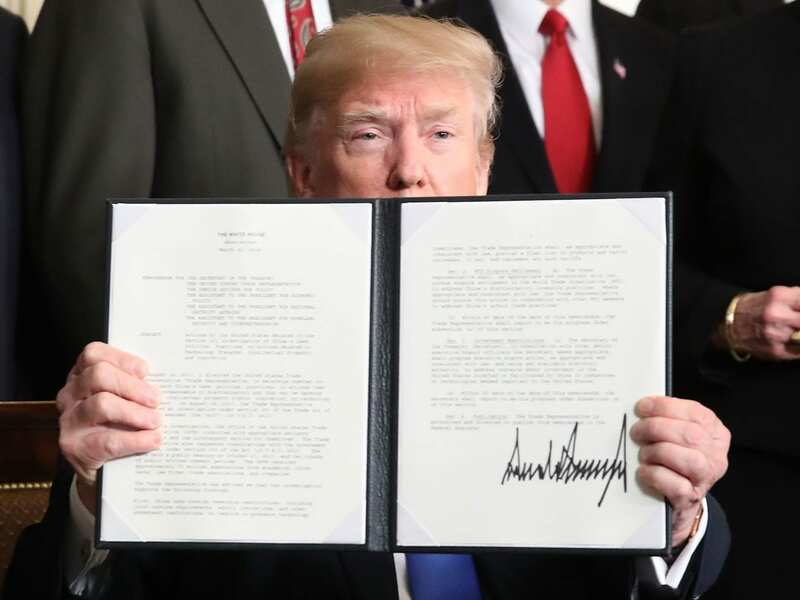 Last month, President Trump directed his trade advisers to develop the list as a way to punish China for what the White House calls unfair treatment of American intellectual property. Trump has also ordered his treasury secretary to weigh new limits on Chinese investment in the United States. The list of tariff targets was made public after the market closed on Tuesday. News of retaliatory tariffs from China on $3 billion worth of U.S. goods contributed to sharp sell-off on Wall Street Monday. The administration will solicit written comments on the proposed tariff targets through May 11 and hold a hearing on May 15. Supporters and opponents began weighing in as soon as the list was released. China’s embassy in Washington, D.C., issued a statement early Wednesday saying Beijing “strongly condemns and firmly opposes” the proposed list. The U.S. Chamber of Commerce said it shares the president’s concern with China’s conduct but warned tariffs would simply raise prices on U.S. consumers and businesses. The targeted items were chosen in an effort to minimize the impact on ordinary consumers. But that did little to mollify critics. The Alliance for American Manufacturing — a coalition made up of U.S. steel manufacturers and the steelworkers union — was more encouraging. The U.S. had a $337 billion trade deficit with China last year, 9 percent larger than the year before. Excluding services, where the U.S. enjoys a surplus, the trade deficit was $375 billion. American businesses have long complained about being forced to partner with Chinese firms and share their technology as a price of doing business in the fast-growing Chinese market. China has pledged to halt such forced technology transfers. But similar promises in the past have gone unmet. The tariffs on China are the latest in a series of protectionist moves announced by the administration in recent weeks. The White House also ordered tariffs on imported solar panels, washing machines and steel and aluminum, though it granted temporary exemptions from the steel and aluminum levies to some of the country’s biggest trading partners. Experts say the glut of steel and aluminum on the world market is largely a product of over-production in China, although China is not a large, direct supplier of those metals to the U.S.
On Monday, China announced tariffs of its own on exports from the U.S. including pork, nuts and sparkling wine. Although the immediate impact of those tariffs was limited, they fueled concern about an escalating trade war.